The Governors shot 44 percent from the field in the opening period, helping the home team jump out to a seven-point lead by the 1:31 mark following APSU’s four three-pointer by freshman Nieja Crawford. However, from that point on, Austin Peay shot 29 percent, 26 percent and 18 percent in the final three quarters. By comparison, the RedHawks increased their percentages late in the game, including a 62 percent shooting display in the fourth period which allowed Miami to pull away. In the final 15 minutes, APSU was 4-of-26 from the field. Senior forward Beth Rates finished with a team-high 13 points to go along with eight rebounds. With senior center Tearra Banks double or triple-teamed in the paint, Rates was able to get open looks around the basket. Banks managed to total 10 points and 10 rebounds despite a swarm of RedHawks around her the entire game. She also picked up an assist and steal in the loss. 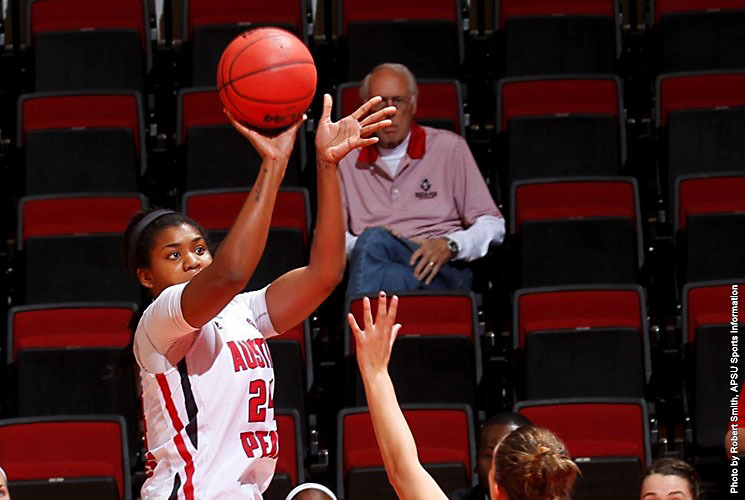 Redshirt sophomore Falon Baker posted 11 points, including one three-pointer which occurred as part of a hot-shooting APSU first period. In addition, Baker grabbed four rebounds and tied for the team lead in assists with two. Sophomore Keisha Gregory opened the game impressively, hitting two three-pointers in the opening four minutes. However, she went on to finish the afternoon with just the six points, and led the team with two steals. Five players made their collegiate debuts on Friday – juniors Bri Williams and Ant’Treasia Patton, and freshmen Shelbe Piggie, Crawford and Arielle Gonzalez-Varner. Despite a height disadvantage in most positions, Austin Peay managed to grab 45 rebounds compared to Miami’s 48. APSU won the turnover battle, 18-11. The Governors face a quick turnaround as they get set to host Christian Brothers, 2:00pm, Sunday, in the Dunn Center.